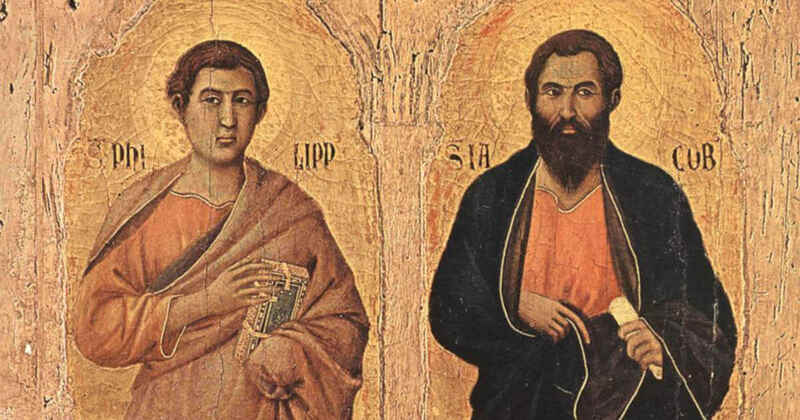 Saints Philip and James, Apostles - Feast - My Catholic Life! The popes follow one another chronologically just like the presidents of the United States. One after another, after another, each inheriting the powers and responsibilities of his office. President John F. Kennedy followed President Dwight D. Eisenhower, just as Pope Saint John Paul II followed The Venerable Pope John Paul I. But there is a difference. Jesus’ placing of Saint Peter as the symbolic and jurisdictional head of the universal Church is, of course, more significant than the popular election of a political leader. The papacy is also different in that every pope is, theologically speaking, the “direct successor” of Saint Peter, the first pope. From this perspective, every pope after Saint Peter is a second pope. So, for example, the two hundredth pope, chronologically, was still the second pope, theologically. No president would claim he is the direct successor of George Washington. He is the successor of his predecessor. Theological truths transcend space and time, since their source, God, exists outside of space and time. The Office of St. Peter is theologically guaranteed by the easy-to-find, on-the-surface-of-the-text words of Christ telling Saint Peter that he is the rock upon which He will build His Church. Today’s Pope, and every pope, occupies that same office, is protected by that same divine guarantee, and immediately succeeds Saint Peter when he is chosen by the Holy Spirit to occupy his chair. What pertains to the Office of the Bishop of Rome also pertains to the Office of the Twelve Apostles. 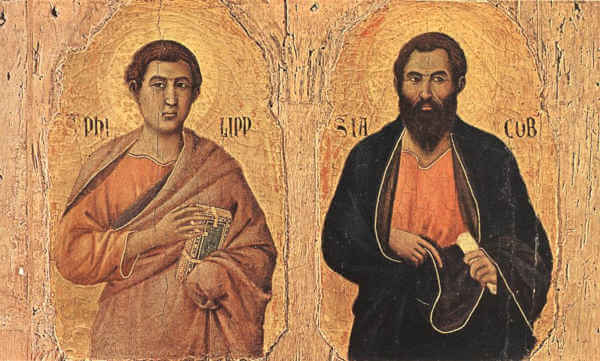 Today’s saints, Philip and James, were called by name by Christ Himself. And after being called, they took the step that many who are called never take. They followed! The Twelve walked at Christ’s side on dusty trails during His years of public ministry. They ate and drank with Him by the fire. They slept under the cold desert sky with Him. And Jesus looked right into their eyes, and only their eyes, and spoke directly to their faces, and only their faces, when He said on a Thursday night that was deeply holy, “Do this in memory of me.” And then they did that, and many other things besides, in memory of Him, for the rest of their lives. The four marks of the true Church are proof of its authenticity. “One, Holy, Catholic, and Apostolic” are the trademark stamp of the true Church, proving it is the Church founded by Jesus Christ. No other ecclesial community bears this trademark, and none except the Orthodox even claims to bear it. The mark of “One” means the Church is visibly one in spite of its many tongues, nations, classes, and races. The Church is one in her doctrine, her Sacraments, and her hierarchy. This oneness is not theoretical. It is tangible, real, and identifiable even to those without a doctorate in theology. This one, Christ-founded Church began with twelve followers who gathered as one around Jesus. These Twelve eventually appointed their own successors, who then, in turn, appointed successors, and so on through the centuries down to the present. The universal college of bishops, the successor body to the Twelve Apostles, is the means by which the Oneness, or unity, of the Church is expressed, protected, and guaranteed. Bishops are not a secondary attribute or development of Christianity. They are embedded into and conjoined with the Word of God in one complex reality. They are not an outside source of authority external to Scripture. There simply would be no Scripture without that pre-existing authority which nurtured and developed it. The Church was the incubator of the New Testament. Not much is known with certainty about the Apostles Philip and James, apart from their names and some few references in the New Testament. Saint James, commonly called the “Less” due perhaps to his short stature, was probably the cousin of Jesus. He was the first Bishop of Jerusalem, likely elected to that post by his fellow Apostles, and was stoned to death by resentful Jews. Saint Philip was from tiny Bethsaida in Galilee. After he received the Holy Spirit at Pentecost, he descended the stairs of the Upper Room and just kept walking into the darkness, his later life and labors unknown to history. More than having specific details about their later Christian exploits, it is more critical to know that Philip and James, and all the Apostles, are the sheet of bedrock into which the nascent Church sunk her deepest pillars and upon whose sturdy foundation the Church’s great weight still rests. Philip and James’ theological legacy continues today in every Bishop who teaches, sanctifies, and governs the baptized people of God. Saints Philip and James, your hidden witness to Christ is less well-known than that of other Apostles, but is eloquent testimony to your quiet fidelity to building the Church after the Ascension. From your exalted place in Heaven, intercede for all who seek your assistance.